During Asbestos Awareness Week, we put a spotlight on asbestos exposure and what can happen if someone is overexposed. Often, the more serious and well-known conditions like mesothelioma and lung cancer receive the most attention during Asbestos Awareness Week. Today we’re touching on the other cancers and benign conditions caused by asbestos. Thanks to commercials on television, many people have become aware that asbestos exposure causes mesothelioma and lung cancer. It is less widely known that asbestos causes cancer of the voice box (larynx) and ovaries. Asbestos actually causes more benign conditions than cancerous ones. These noncancerous conditions range from mild and nonthreatening to severe and life-threatening. The latest treatments and medications have fortunately improved quality of life for people coping with these conditions. Familiarity with these other asbestos-related diseases helps those previously exposed know what symptoms to watch out for as signs of a developing condition. Though some of these diseases are life-threatening, an early diagnosis can make all the difference to survival. Knowing that treatments are available to control symptoms is reaffirming to anyone with a history of asbestos exposure. Though it only represents 3 percent of female cancer diagnoses, ovarian cancer causes more deaths than any other female reproductive cancer. In 2012, a study by the International Agency for Research on Cancer (IARC) confirmed that asbestos exposure causes ovarian cancer. Many cases were documented in women whose father or husband worked with asbestos. Though the exact mechanism for how asbestos fibers reach the ovaries is under debate, researchers theorize the fibers are transported by the lymphatic system. Some cases were associated with asbestos-contaminated talc used for hygiene. Ovarian cancer is treated with surgery, chemotherapy, radiation therapy, hormone therapy and targeted therapy. The overall survival rate for all types and stages of ovarian cancer is 45 percent. A fortunate 15 percent of cases are diagnosed in stage I and have a 90 percent survival rate. Laryngeal cancer is rare and most often caused by smoking in combination with alcohol consumption. Yet a 2006 report sponsored by the National Institutes of Health proved that asbestos exposure causes cancer of the larynx, known as the voice box. In 2012 the IRAC confirmed the connection in a scientific review of all evidence to date. Researchers suspect that inhaled asbestos fibers lodge in the voice box on the way to the lungs. Treatment varies by cancer stage and involves surgery, chemotherapy and radiation therapy. The prognosis for small tumors that haven’t spread to lymph nodes is good with cure rates between 75 and 95 percent. If caught early enough, radiation therapy may offer a cure and preserve the patient’s voice. Discover tips to ensure you keep your family safe from the dangers of asbestos. Asbestosis is a progressive pulmonary disease that inhibits lung health and function. It develops when inhaled asbestos fibers accumulate in the lungs and cause scar tissue to form. Over time the scar tissue hardens the lungs, limiting elasticity. Breathing becomes difficult and painful as the condition progresses. Scarring impairs the lungs’ ability to supply oxygen to the blood stream. Patients often need oxygen tanks and pain medication to control symptoms. There is no cure for asbestosis and its progression cant be halted, but most symptoms are minimized with medication and oxygen supplementation. About half of all people with severe asbestosis develop a condition known as clubbed fingers. The tips of fingers become misshapen, swollen and may take on a box-like appearance. The condition appears to be caused by the biological effects of asbestosis rather than directly by asbestos fibers. Clubbed fingers tend to develop early and don’t go away once developed. It is a sign of more severe asbestosis and is associated with higher mortality and likelihood of disease progression. While conditions like asbestosis and lung cancer affect lung tissue, other conditions affect the lining of the lungs known as the pleura. Mesothelioma is the only cancerous disease that affects the pleura, yet asbestos can cause several benign conditions to develop in the lung lining. The pleura contains two layers: An inner layer that lines the lungs, and an outer layer that lines the ribs. 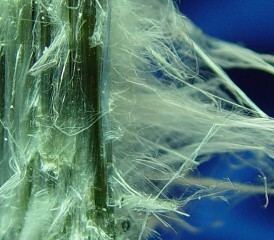 The presence of asbestos fibers can cause these layers to inflame and rub against each other, a condition called pleuritis. Medication is effective at controlling pain. As scar tissue accumulates on the lining of the lungs, collagen deposits called pleural plaques can develop. Plaques most often form on the outer layer of the pleura that lines the rib cage. Between 5 and 15 percent of plaques become calcified and harden as a result. They rarely cause symptoms, but some plaques may cause pain and could require medication. Inflammation caused by asbestos can weaken blood vessels, causing them to leak fluid. This fluid builds up within the pleural layers, called pleural effusion, and can interfere with breathing and cause pain if left untreated. A procedure called talc pleurodesis can permanently prevent fluid buildup. Pleural effusions often precede extensive scarring and thickening of the pleura, known as diffuse pleural thickening. As the pleura becomes rigid and thick with scar tissue and lung function is compromised, pain may develop. Medications for pain, bronchial dilation and steroids offer relief from symptoms. If you have a history of asbestos exposure and develop any abdominal, pelvic or pulmonary pain or dysfunction, visit a primary care doctor or specialist immediately. Prognosis is improved and treatment is more effective for all asbestos-related conditions when diagnosed early.